The creditors of Rangers have formally rejected a CVA proposal which would have allowed the club to trade its way out of administration. The decision was taken during a meeting at Ibrox stadium on Thursday, which lasted just nine minutes. Rangers' largest creditor, HM Revenue and Customs (HMRC), said on Tuesday it would reject the CVA plan worth £8.5m. The club will now be liquidated and its assets sold to a new company which will aim to continue with football at Ibrox. Rangers was forced into administration by HMRC on 14 February over non-payment of tax totalling about £14m. The club is also being pursued by the tax authority for up to another £75m in unpaid bills, penalties and interest, relating to its use of Employee Benefit Trusts (EBTs) to pay dozens of players during the last decade. HMRC's share of the overall debt gave it an effective veto over the CVA proposal which was put forward by administrators from Duff and Phelps and a consortium, headed by Yorkshireman businessman Charles Green, bidding to buy the club. A CVA enables companies to reach an agreement with creditors about how debts could be repaid and provides for partial or full repayment, depending on what the company can reasonably afford to pay. Thursday's meeting, which was attended by 30 creditors, was a formality after the tax authority said earlier in the week it would reject the CVA, which had offered less than 10p in the pound. HMRC will now appoint joint liquidators from BDO to wind up the 140-year-old football club. In the meantime, Duff and Phelps will press ahead with a plan to sell the club's assets - including Ibrox Stadium, the nearby Albion car park and the Murray Park training facility - to Mr Green's consortium for an agreed sum of £5.5m. It is understood that the trading name for the new company will be The Rangers Football Club. Mr Green has several major hurdles to clear, however, before the club is back playing football. The new company has no share to play in the Scottish Premier League (SPL) and is not licensed by the Scottish Football Association (SFA). Mr Green also faces a battle to retain the club's players following liquidation. He believes, as do the club's administrators, that the players contracts will transfer over to the new company. The players' union has stated that this is not the case and that they are free agents, able to talk to other clubs. It is also unclear whether the new company will be liable for any footballing sanctions incurred by the old company in the event that it acquires the SPL share. Rangers have already been found guilty of bringing the game into disrepute and are under investigation over allegations that they operated dual contracts and improperly registered players while running the EBT schemes. 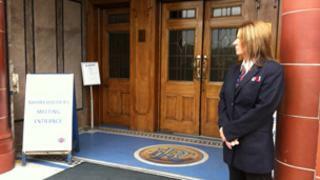 An SFA appeals tribunal will rule in the weeks ahead on what sanctions Rangers should face over the disrepute charge. Those under consideration will include a suspension or expulsion from the SFA. Such sanctions would also be considered if it was found the club was found guilty over the dual contracts issue. Another unknown is how the footballing authorities - SFA and Uefa - would react to any new club while the old club still had outstanding debts to footballing creditors (other teams) totalling more than £3m. Mr Green's ambitions for a new club may also be thwarted if liquidators from BDO decide to challenge the asset sale. Liquidators have the power to unpick any transactions which they believe are not in the best interests of creditors.